Ask fellow campers about "Cantwell RV Park" and nearby attractions. This campground has the nicest staff you will find anywhere! The are also hardworking and clean the shower after each use. We had booked 3 nights and only stayed 2 and they refunded us without any issues. They do dog sit and walk but are limited to one or two a day so reserve this service early if you need it. Our site was typical but they space you so your not right next to each other. This may not be the case during peak times. We camped at Cantwell RV Park in a Truck Camper. Friendly staff. Nice gift shop. They clean the showers after each use. One mile from nice view of the mountain so it's easy to drive out to take pictures. The only complaint I have is the surface material. It is gravel with such inconsistent sized rocks it makes it hard to walk on or level your rig. The rocks vary from very small pea-size to larger than fist-size. Very hard to walk on without twisting your ankle. Be careful. Short sites. May have to park tow vehicle in overflow. Poor layout, as the dump station is right next to the office, so you have to exit the park and come back in to dump. Blocks entrance for other rigs entering campground. Our site was not long enough for our 24'TT plus truck. Had to park truck in overflow lot. We camped at Cantwell RV Park in a Travel Trailer. This park has the most helpful and enjoyable campground hosts we have ever experienced, and we have been RV-ing since 2009. They gave us suggestions of things to do - where to stop along the Denali Highway, the joy of Dog Gone It's sled dog visit, etc. 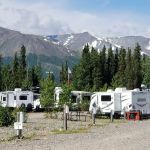 The RV park is well situated for day trips into Denali National Park, yet far enough away from the tourist crowds to be enjoyable. The facilities are clean, and we really enjoyed our time there. We camped at Cantwell RV Park in a Travel Trailer. Level, all-gravel pull through sites in an open area. 30A power and water. No TV, no wifi. Verizon coverage OK. Very friendly owners/operators and well-tended park. No sewer at site but dump is convenient (does require exiting and re-entering park). A half-mile off the main highway so no road noise. The owners dog-sat for us ($35/nite) while we camped at Teklanika camp in Denali NP for 4 nites. Cantwell is a tiny town, bring with you what you need, but here is a fuel station (high $) nearby. There are some RV staples available at the park office, and washers/dryers. We camped at Cantwell RV Park in a Fifth Wheel. There is some shopping at the Denali NP entrance, 29 miles up the road. Nice little park, trees could present a problem someday for any rig with slideouts. It's quiet and off main throughfair a short way. Beautiful scenery. We camped at Cantwell RV Park in a Travel Trailer. Denali National Park not far off - and if time drive out the Paxson highway about 15 miles or so for beautiful scenery! We stayed here on our way to Denali. The campground office personnel were exceptional - very friendly and helpful. The campground is nothing more than a gravel area with electric (and water if you need it), but it was very well maintained. The showers were cleaned after each use - I had to wait while that was taken care of and someone had just walked out. There is also a laundry room and they sell ice and firewood. We camped at Cantwell RV Park in a Travel Trailer. There were some activities nearby and the office will assist in setting them up. For the money the park was a good deal $24. I would stay here again. Nothing fancy but it is a place to dump and load fresh water. We had an electric only site (30 amp). Camp ground could definitely use some work but the staff was friendly and polite, showers were hot and they have laundry. Denali entrance is 27 miles away. Entrance into park could use another section of culvert, its tight but you can get in. No tree limbs to worry about. Park is basically wide open. All gravel park, dump is inconvenient because you have to go out of the park and re-enter to dump. But there is a dump and fresh water. We camped at Cantwell RV Park in a Motorhome. Denali is 27 miles away. Nice clean showers, laundry and friendly/helpful personnel. Did not like any of the sites because it's parking on rocks. Watch your step or you could sprain an ankle. Site was so tight our lawn chairs were placed up against our tow vehicle and barely fit. It was ridiculous. Stayed one night. We camped at Cantwell RV Park in a Motorhome. We did not like this campground as much as other reviewers. It is just an outflow field (think big rocks and gravel from a glacier) that someone made into a campground. We made a reservation with the owner and when we checked in, the office staff tried to change our site. Sites are listed as big rig friendly but we were not able to park our truck on site or would it have worked on any site. Did not use the bathrooms or laundry. Water lines are run on the ground and you have to be careful to avoid them when you park. Dump station is situated at the entrance so one must completely exit the campground and drive back in to use the dump station. Do not get fuel at the local stations because it was the highest we encountered in Alaska. 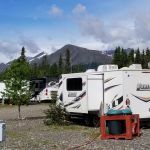 We chose this campground because it is within 30 miles of Denali National Park. We would not stay here again. We camped at Cantwell RV Park in a Fifth Wheel. Very friendly staff. Quiet, pretty setting. Short drive to Denali. Large, pull thru sites. I'd definitely stay again when in the area. We camped at Cantwell RV Park in a Fifth Wheel. Tight entrance - above ground water system - orange hose - drive over it but don't park on it! Had to do some maneuvering to accomplish that. About 20 minutes from Denali and worth it not being cramped in the small parking lots there! Country setting. Quiet. They had a really nice area for tenters. Wi-Fi was free and worked okay. Saw moose on the way into Denali! Good Sam discount. Would stay here again. We camped at Cantwell RV Park in a Motorhome. This park is nice enough with the rest rooms and showers rating a 10. Place is run by 2 pairs of work campers, one pair is really nice. Large gravel in the parking lot, and you have to be careful to not park your wheels on the water line, which is plastic pipe running along the ground. Wi-fi is good with occasional hiccups, but generally good. You have to leave, then pull back in to dump, then go around the park again to leave! We would stay here again. We camped at Cantwell RV Park in a Fifth Wheel. Easy access to this park. It is a large gravel "parking lot" type of park as many are in Alaska. Level sites with water/electric hookups but only a dump station available. Although these are "big rig" sites you actually could not leave your toad hooked up and not stick out of a site. Owner very nice, hosts very defensive about the Wi-Fi not working at our site. I was assured that the Wi-Fi worked well throughout the park and when it didn't and I mentioned it to the hosts they came up with all sorts of explanations/excuses most of which would be the RVer's fault. It simply did not work at our site period. Restrooms and showers were spotless and cleaned after each use. I doubt we would return. We camped at Cantwell RV Park in a Motorhome. All the personnel here are very nice and helpful. There is no sewer at the sites, but they will dump your tank for you at your site for a minimal fee. Restrooms and showers are very clean, they try to clean the showers after each use. The laundry is clean and the machines work well. The dryers dry quickly the first time without spending extra money. There is a sign on the porch to the office asking you to wipe your feet but says nothing about taking off your shoes. This is our second stay here and we like the atmosphere and the people very much. We give this park an AA+. They also host fishing trips each Monday for the guests of the park. While here on July 4th they hosted a cookout furnishing all but the side dishes, the guests who attended brought a side dish of their choice, everyone had a great time, the food and the company were both great. We camped at Cantwell RV Park in a Fifth Wheel. Rate based upon weekly rate divided by 7. 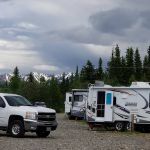 What a relief it was to get out of cramped Denali village and into an open, pleasant RV Park. Actually, it was still a large gravel parking lot, but uncrowded with decent sized spaces, and they tried to spread people out as much as possible. The sites had only water and electric, and they gave us a site that would "probably" get WiFi (it did fine) The people were extremely friendly. They took people fishing every Monday if anybody wanted. There was a nice potluck on July 4 with the hosts providing the main dishes. The showers were spotless - cleaned after every use. We were delighted with the space, the people and the setting. And it was only 27 miles from Denali Park. Now if they could just have smaller gravel in their gravel parking lot, it would all be wonderful. We would definitely stay there again. We camped at Cantwell RV Park in a Motorhome. Are you affiliated with Cantwell RV Park ?